Glad also were you in body and heart. On the sixth Hilarion went to Olympus with a pure heart. Blessed Hilarion was from Cappadocia and lived during the reigns of the emperors Nikephoros the Patrician (802-811), Staurakios (26 July 811–2 October 811), Michael Rhangabe (811-813), the iconoclast Leo the Armenian (813-820), the iconoclast Michael the Stammerer (820-829), and the iconoclast Theophilos (829-842). The name of his father was Peter and his mother was named Theodosia. His father was known to the emperor, because he would give the bread for the imperial table. Having been born from them and nursed, the Saint was sent to school in order to carefully be taught sacred letters. When he was twenty years old, he left father, mother, household, riches and all worldly things according to the gospel prescription, and he entered the Monastery of Xerokepos in Constantinople. Leaving there he went to the Monastery of Dalmatoi, where he received the great and angelic schema. Possessing obedience, humility and quietude, the renowned one worked in the gardens of the monastery for ten years. Having cleansed his soul of every passion, and illumined it with the virtues like the sun, he then became a wonderworker by divine grace, and he banished from a young man an unclean demon that was troubling him. For this reason the abbot of the monastery made him a Priest, even though it was against his will. When the abbot died a year later, the Saint withdrew from the monastery and went to the place called Opsikion, and there he went to the Monastery of the Katharon. When the monks of his monastery learned of this, they told it to the then Saint Nikephoros the Patriarch, and the patriarch informed the emperor Nikephoros the Patrician, urging him to have the Saint brought back. 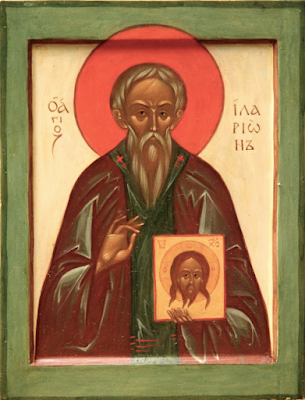 The Saint was obedient to the urgings of the emperor and the patriarch, he returned, and he became both Abbot and Archimandrite, as it was the custom there to do so, as determined by a Synod. Eight years passed in which the Saint shepherded the flock of Christ as an imitator of Christ. When Emperor Leo the Armenian came to the throne in 813, and rejected the veneration of holy icons, Saint Hilarion was brought before the emperor, and with certain arguments and promises he tried to persuade him to cease the veneration of holy icons. But the Saint rebuked him, calling him an atheist and a new Julian the Apostate. For this reason the emperor became enraged, and he threatened him that he would deliver him to many unbearable punishments, then he put him in prison. With time the Saint once again stood before him, and spoke the same words to him as he did beforehand. Then he was delivered to the like-minded Patriarch, namely Theodotos Melissenos (815-821), also called Kassiteras, as if he would persuade him. Because the Saint did not give heed to him, he was shut in a dark prison for many days causing him to suffer. It was also ordered that he be given neither bread, nor water nor any other food. When his monks and disciples heard this, they went to the emperor saying: "Give us our shepherd, O Emperor, and after a short while we will take it upon ourselves to do your will." The emperor was outwitted by this promise, and soon after gave them the Saint. Because the Saint tarried in his monastery, and received little rest due to his former sufferings, he was liberated from his hunger, to which he was subject in prison. When the emperor saw that the monks did not pay their promise, but rather mocked him, for this reason he punished the monks and had the Saint imprisoned. Then he sent him to the Monastery of Phoneos, which is found at the corner of the City, and there he was imprisoned for six months, that he may suffer more, for the abbot of this monastery was a harsh man, savage and without compassion. The emperor then had the Saint brought to the imperial palace, and he tempted him with flatteries in order to beguile him. Not giving heed, the Saint was ordered to be imprisoned in the Monastery of Kyklobios. After two years and six months the Saint was removed from there, and he was imprisoned in the prison called Noumera. There he was harshly flogged, and was exiled to the fortress called Protilion. Because Leo the Armenian was killed with a knife, in the same church in which he mocked and cast to the earth the holy icon of Christ, and having cast away his wicked soul, Michael the Stammerer became emperor in 820, and the Saint was released from prison. A Christian woman gave him hospitality from her own substance, and she served him for seven years. When the Stammerer's son, Theophilos the iconoclast became emperor in 829, the sinner gathered all the former Confessors on behalf of the holy icons, and had them imprisoned. Then the blessed Hilarion was examined, to persuade him to embrace the imperial order. Because the Saint rebuked Theophilos as an atheist and a quack, he was made to carry on his back one hundred and seventeen pieces of wood, then he was exiled to the island of Aphousia, which is near Alona, and is under the Archbishop of Proikonisos. There the Saint dug out a rock, and he made a small and narrow cell. There also by his prayers he brought forth water, and he spent eight years there. 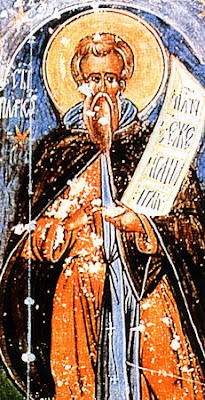 When Theophilos died and his wife Theodora gathered all the Confessors and Venerable Fathers in Constantinople from their places of exile, and having established and upheld Orthodoxy through the restoration and veneration of the holy icons, then Saint Hilarion was also released from exile, received back his monastery, and shined with miracles. He lived three years after this, and in a God-pleasing manner he oversaw his disciples, then he departed to the Lord, at the age of seventy in 845. By cultivating the words of the Lord, thou didst blossom with grace like an olive tree. With the oil of divine virtues and by thy confession, blessed Hilarion, thou didst gladden those who faithfully cry to thee: Glory to Christ Who has strengthened thee; glory to Him Who has crowned thee; glory to Him Who through thee works healings for all. Though contesting with fire thou wast not burned, for the dew of God refreshed thee. Thou didst rejoice to accomplish struggles beyond nature. As thou art now among the righteous, O Hilary, remember us.